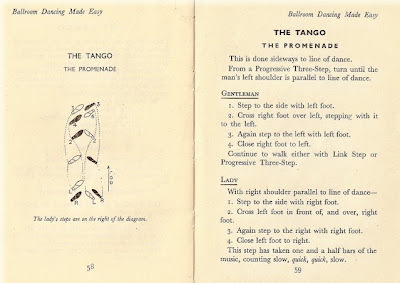 I am fascinated by old dancing manuals - this example is 'Ballroom Dancing Made Easy' by Robert Brandon, first published by C.Arthur Pearson Ltd, London in 1936, and then revised in September 1942. I like the notion of people trying to teach themselves the Slow Foxtrot from a book in the middle of the Second World War. The English ballroom dancing phenomenon successfully translated a range of dances from across the world into rigid routines with the gendered foosteps of 'gentleman' and 'lady' clearly laid out. How far the tango, as precribed here, reflects the origins of tango in Argentina is another matter. 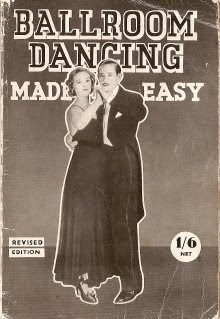 Over time a fixed repertoire of dances developed - this book advises that only four main dances are essential: the Waltz, the Slow Foxtrot, The Quick Step and The Tango.